Products for a restomod mustang interior are nearly unlimited, as are the places to search for them. With the possible exception of the Harley Davidson motorcycle and the Chevrolet Corvette, no other motor vehicle has more parts and accessories available than the Ford Mustang. Where to start looking? Starting online is a good choice. Classic Industries is a good place to begin. They stock a large amount of restomod parts and accessories, starting from 1965. Three catalogs cover all the years, from 1965 to 2017. The word restomod should be explained. Basically, it is a newly manufactured part designed to replace or upgrade an original part. Restomod parts and accessories are often better than the original, since they benefit from today's better tooling, tolerances, and metallurgy. Unless you insist on all original parts for a period restoration, restomodding is the way to go. Car clubs are a fine place to find that needed part. As part of the larger Mustang community, these clubs are in touch with large part builders as well as the smaller guys, the ones who might do custom upholstery or pin-striping by hand. The Mustang Club of America is the central clearing house to check out for more information. They are key to identifying a local club in your area. They also have classifieds to go through. Don't see what you want? Post a message to their board. Their basic membership costs less than an oil change. Ebay is an excellent resource for those who know what they are doing. My last search revealed 181,447 results for Mustang parts. Filters allow you to search for different makes, models, and years, as well as warranty periods and whether the part is Ford branded or not. Many small shops, ones that used to have a brick and mortar location, have now gone entirely onto the web. Ebay is a good place to look for that small specialty outfitter. Craigslist is a good choice for local looking, although you can easily expand your search to neighboring areas. You can also look into bigger cities like Los Angeles, to see if a company has what you want and if they are willing to ship. At last look, Craigslist for Los Angeles had 120 pages of miscellaneous Mustang parts for sale. Make sure you identify any return policy before ordering. Salvage yards for Mustang part have largely gone online, although you might find a yard in your community if you live in a big metropolitan city. Uneedapart.com is an interesting site. They claim connections to salvage yards across the country, enabling you an entry into the recycled or reused part business. Don't forget hardcopy publications. Peruse the many Mustang magazines that exist at a large bookseller. You'll find ads for all sorts of Mustang part companies. Another possibility, though limited, are the low to no cost circulars and magazines found at truck stops and convenience stores. 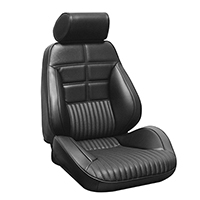 Products for a restomod mustang interior exist all over the country and all over the world. With today's technology, that search has become much, much easier than ever before.